Spring time in the city! A winter round up of restaurants. Summer has been much of the same. I am not taking classes this summer as they are all online only and me and strictly online classes aren’t a thing that work! Work has been busy and good as is life. Dad and I have went to lunch most weeks over the winter. I know I have posted a couple of things but left out a lot. I will try to catch up with the other places we have tried in between. This one was my pick. I had heard about it from a friend on Facebook and I am always down to try a new chicken place. It was a new building and was very clean and spiffy looking. They had a pretty varied menu, but all were chicken options. They had fried tenders, wings, salads and some sandwiches. They also had some shakes and other desserty options although we didn’t explore those at all this time. Dad and I both went with a chicken tenders platter. It came with your choice on number of tenders, fries, coleslaw, a piece of texas toast and a drink for a fairly reasonable price. I thought everything was pretty good. There was a good flavoring to the breading on the chicken but not overpowering. A decent fast food chicken meal option. This was a Dad pick! Sorellas is a little deli right off the square in Liberty. The first thing that hit me when we walked in was that the place smelled delicious! They had your usual fare of sandwiches made to order, soups, salad and mouthwatering looking desserts. I will definitely go back to Sorellas! This gem was a pick of mine (I think). It is in Independence on 40 Hwy in its own building. Its been there a while and I can see why after visiting. We were greeted and seated and met our waiter. He was engaging and fun which is always nice. We ordered an appetizer to start that day and chose the Melanzane Fritti which is basically fried eggplant with marinara and cheese. It was very good! Eggplant can be tricky to cook (I think so, anyway) and this was done really well. They also bring bread and butter to the table for you to enjoy. You can also order the olive oil and spices service for extra. I got Chicken Spedini Samantha. It was cooked perfectly and served with Fettuccine Alfredo and artichoke hearts. Yummy. Dad got the Beef Spedini (the special that day) and it came with a side of Fettuccine Alfredo as well. We both enjoyed our meals and I have actually been back a couple of times with Josh for dinner. It’s good. Franks sits along Main Street in downtown Parkville, Missouri. It is a small and unassuming place. Mom, Dad and I went on a lovely Thursday afternoon. We started with the fried ravioli with sugo sauce appetizer. I got the lunch chicken alfredo, dad got the lasagna roll and mom got the Italian Steak Sandwich with fries. We also had bread pudding for dessert, one shared between the three of us. All the meals were good and at a decent price. I need to remember this place when we are looking for lunch options at work! We went to the Picklemans location in Westport and had an OK lunch. If i’m being completly honest, I don’t remember much about it. It’s a sandwich shop and wasn’t bad. After we had lunch we needed some sweet reward that day so walked around the corner to Doughnut Lounge and got what else besides a couple of donuts! Smores for me and something with pretzels on the top for dad. They were both delicious! Rheinland serves authentic German food on the square in Independence MO. This was a dad pick and he has been there several times (and swears I have been there too – but too long ago for me to remember!) and he decided that I needed to try it out to remember this time. I agreed. One of our favorite dishes is Sauerbrauten. Sadly they didn’t serve it at lunch time, which is understandable given the time it takes to prepare. We started with an appetizer of Käsespätzle (cheese spätzle). That was a dish of cheesy, oniony goodness! I ordered the Reuben with hot potato salad and dad went for the beef stroganoff. Both meals were great and we had to finish up with dessert! It was a boozy, chocolately, ice creamy thing. Yum! Granite City was an adventure Mom joined us on too. It was decent food and I had eaten there a couple of times. Never a bad meal, just nothing to write home about in my book! Cascones is a Northland Kansas City staple. Many pre-dance dinners have been had there as well as celebrations of all sorts. Its much more subdued there at lunchtime but a solid choice. In interest of full disclosure I don’t remember everything we ordered but I know dad got a parmigiana (maybe veal?) and I got the lasagna. I do remember by lasagna being AMAZING. I’m usually pretty picky when it comes to my lasagna, preferring mine (my mom’s recipe) to others but this one was great! Who wants to go to Cascones for some lasagna with me?!? I think that wraps it up for now. Check back soon for some more! I promise it won’t be months this time! Hello again! Today I decided to take us both out of comfort zones. I figured that it was what our plan with our weekly lunches was really about. Sometimes I just have to force us out there. We are guilty of picking more “safe” choices and I decided to go outside the comfort zone with Mudbugs. We walked in to the restaurant and its is set up in the style of a food truck, Mudbugs original set up. You order and pay at the front counter and pick up your food at the back pickup window. One look at the menu and Dad leaned over to me and said “I don’t have a warm fuzzy feeling about this”. I just laughed at him and told him to try something new and pointed out some “safer” options. I decided to go all in (well, almost…) and go for the Shrimp Po’boy. I did opt out of the sauteed craw fish that comes on the sandwich…I just wasn’t feeling THAT adventurous! Dad opted for the Classic Roast Beef Po’boy (also without the craw fish). I got fries to go with mine and dad opted for the fried okra. Our meal came out pretty fast and the person that took our order actually brought us our food to the table. Much to both of our surprises, it was pretty good. The shrimp on my sandwich were perfectly breaded and fried and they were generous with the amount of shrimp. The toppings on my sandwich were well paired, although i’m not sure what the polenta added to my sandwich, but it wasn’t bad. Dads sandwich was very good too. The roast beef was nicely seasoned and was generous in the portions of it. We combined the fries and okra and shared. Both items were good. The okra wasn’t slimy and was well breaded. We heard that they would give samples of their other items such as the red beans and rice and gumbo. When we were checked on we asked for a red beans and rice sample and they obliged. It was good! I don’t even like red beans! Dad really enjoyed it and wished he had ordered some. Later in the meal the Chef had a break in the action and made his rounds. He was warm and friendly and got us some gumbo samples to try too. It was good! I don’t know that I would eat a whole bowl but it was nice to try it. Over all we had a good meal and didn’t have to resort to emergency back up fast food (which I told dad we would if we had to). We were both full and don’t regret a thing! Wait…dad regrets not ordering the red beans and rice, but that just means he needs to go back! I will definitely go again! Maybe next time I will let them put the crawfish on the side to try it out. Another week, another lunch! Grandma was up for the week and Dad worked hard at getting her to plenty of new places to eat (She lives in a small town with limited options) and he succeeded! For lunch this week Dad picked Milwaukee Delicatessen Company to try out. I had actually discovered this place a couple of weeks ago, unbeknownst to Dad as Josh and I were driving around downtown on a Pokemon hunting adventure. (Don’t judge!) I even snapped a picture of the front then so I wouldn’t forget it! We arrived at our normal “early” lunch time to find that parking was sparse around there. We ended up in the garage across the street that is $2 per 20 mins, which was fine. It’s in a cool old building with a lot of what seems to be original decor. I only got one pic of the decor, with a guy in the pic too. Next time we go there I want to sit upstairs! They had a menu of yummy looking sandwiches and salads but I spied someone at an adjacent table with pizza and I was sold. Their slices were huge! They had specialty slices to choose from or you could “build your own” slice. I went with the build your own and chose my favorite: pepperoni, pineapple and cream cheese. Yes, you read that right. Cream. Cheese. If you ever have the option, you should try it. You won’t regret it. It’s hard to tell in the picture but they actually cut it into diamond pieces for easier eating. It’s on a New York Style Crust. YUM!!!! Dad and Grandma had big dinner out plans that evening so they decided to split the Central Branch Ruben with German Potato Salad. They both enjoyed the sandwich and it was a decent ruben. The German Potato Salad was cold (we always think of it being hot). It was a good meal overall and I will definitely go back sometime! Maybe i’ll carry out a pizza from there. You can get a 26″ pizza for very reasonable. It is Restaurant Week here in Kansas City which means that its time to try a fancy restaurant we normally wouldn’t go to because its out of the normal budget. For those of you who don’t know what restaurant week is, its a set week in January where all participating restaurants offer a special menu for lunch and/or dinner that let you sample their dishes. Lunch is $15 and Dinner is $33, usually per person but there are a few exceptions. Since we were going fancy, I decided to try The Capital Grille, a place I’ve heard of many a times but never had the chance (or funds) to go to. I did make one mistake with the choosing of The Capital Grille, that was not making a reservation. I suspect its a popular lunch spot anyway with its location and when you add restaurant week on top of it, they are SUPER busy. Luckily we always go early and we got there before the bar filled up and were able to get seats with full service at the bar. We had very prompt service from Jenny the moment we sat down at the bar. Sitting at each seat was a Restaurant Week menu. First, you got to start of with a Wedge Salad or Lobster Bisque soup. I chose the salad (with ranch dressing instead of the listed blue cheese – because, NO) and Dad went with the soup. The salad was basic but good. What is the point of a wedge salad anyway? They are just being lazy in the name of fancy in my opinion… Anyway, Dad was taking a risk with the soup as he wasn’t sure he would like it. He was right. He tried a couple of bites and was not impressed. Jenny noticed this and offered to exchange it for a salad for him. What a sweetheart! 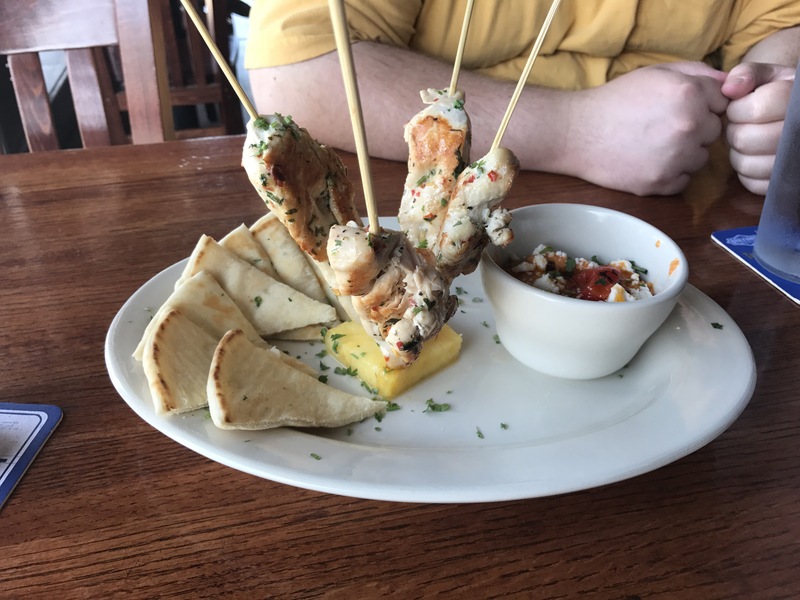 For the entree portion, they had four different choices. I went with the Dry Aged Sirloin with Roasted Pepper, Fresh Mozzarella and Arugula Salad. Jenny didn’t even bat an eye when I ordered the steak medium well, as I do when it comes to steak. Dad chose the Grille’s Signature Cheeseburger with Parmesan Truffle Fries. Both meals were great! My steak was perfect and very tender even done medium well. Dad’s burger tasted great and the truffle fries were truffle-y without being overwhelming. For dessert you could choose from Flourless Chocolate Espresso Cake or Classic Crème Brûlée. I wanted to try the cake, but I saw a Crème Brûlée come out and the pull was toooooo strong. We both went with the Crème Brûlée and were NOT sad at the choice! It was absolutely delicious and I am going to try to make some at home soon! Over all it was a delicious meal and would definitely go back. I just wish it wasn’t so far out of my normal price range!